Triple Crown Lite is designed to be a palatable feed for horses that will provide a desired intake level of supplemental minerals and vitamins without encouraging excessive weight gains. Triple Crown Lite should be fed to horses that have a tendency to become overweight or are receiving less than 4 pounds of grain per day. 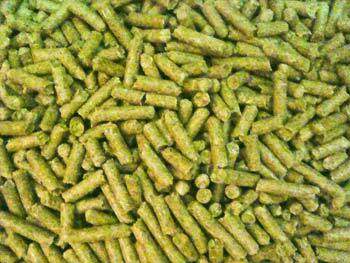 Triple Crown Lite should be fed in combination with hay and/or pasture, salt, and fresh, clean water. If your horse is being fed more than 5 pounds of grain daily in order to maintain desired body condition, Triple Crown Lite is not recommended. MATURE HORSES: Feed 1-2 pounds of Triple Crown Lite per 500 pounds of body weight per day. 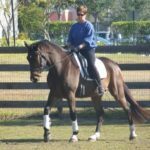 If more than 4 pounds of Triple Crown Lite is required to maintain the horse’s desired body condition a switch to another Triple Crown formulation such as Low Starch may be necessary. 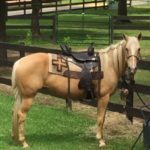 PONIES AND MINIATURE HORSES: Feed 1 pound of Triple Crown Lite per 500 pounds of body weight and adjust feeding rate to maintain desired body condition. CAUTION: In order to avoid excessive mineral and vitamin intake, DO NOT feed more than 5 lbs. of Triple Crown Lite per day. Chronic intake of excess minerals and / or vitamins can adversely affect the health of your horse. 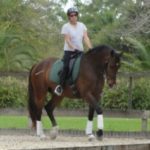 I started my mare, Maggie, on Triple crown Lite 9 weeks ago and started her on an exercise program. This picture is of Maggie 9 weeks later and lighter.She is off her allergy medication and breezes easily through barrel pattern. Shiny coat & mane & happy, healthy horse! I rescued Angel last year. She looked very neglected when I picked her up. She has been on Triple Crown Lite, pasture & coastal hay. It was March when we got her. She stayed shaggy longer than my other horses….. Coat & mane shiny, hooves are excellent! I was planning to “re-home” her, but we have decided to keep her. She is very good for endurance! Here is her before and after. Looking great on Triple Crown! I am attaching a few photos of my old guy (he is 30) and let you see how GREAT he looks. 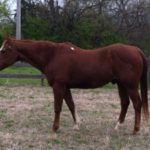 I have had this horse on Purina Equine Senior since he was 19, retired him at 22 — arthritis in back hocks and cataracts. Had a lot of trouble keeping weight on him. Tried Total Equine last winter, when I bought my mustang and that’s what he had eaten all his life. 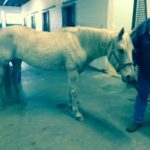 He developed diarrhea on that, switched him back to equine senior. Still his condition was not good. Visible ribs, backbone prominent, loss of topline, hip bones prominent. I think he looks like a million bucks to be 30 years old. He used to have what I called “old man bumps” around his neck area. Those are gone. He has wavy, coarse hair, but it is silky smooth now. He has been slow just getting in and out from pasture and into his stall for feedings. Most of the time he just hangs out near his stall, under the overhang. He is out grazing with other horses and I even saw him trotting along the fence line yesterday. I am so pleased with this feed. I have also been giving him 1 cup of Omega Horseshine split between two feedings on top of feed. “Pretty is as pretty does”… using Triple Crown Feed, he is both! Gaston was born and raised in Minnesota and moved to Florida almost 4 years ago. He had a lot of problems adjusting to the South Florida climate. The worst being he was plagued with sores that would not heal that always became Florida Sores. He is been on the “Florida Sore Protocol” for almost a full year now. He is staying sore free. Gaston is fed TC lite and a little of Rice Bran oil to keep him looking great!